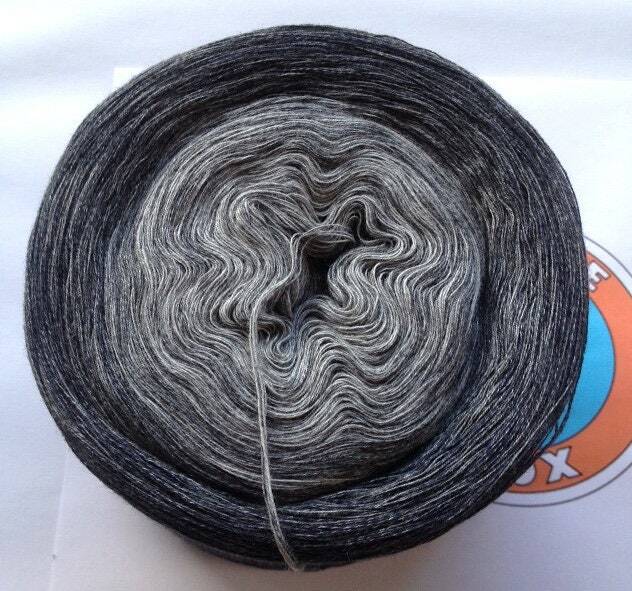 About 227g/900 m wrapped, folded gradient yarn in Denim Look (the Yarn is both mouliné and printed) "Black Stone" made of 100% cotton (Egyptian giza cotton). Washing at 40 °c (manufacturer recommends that the _erste_ wash should only be done at 30 °c in order to prevent it from running), no dryer, ironing on a medium level. 154g/600m Giza Bw.-denim yarn "Black Stone"
367g/1200 m merino Extraf. "Black Rainbow II"
356g/1200 m Merino extrafine "New York"
183g/600 m 100% Merino extra-fine "Emerald Forest"